Bring your hands into the game world and take full control of your VR experiences, giving an even deeper sense of presence and further enhancing your immersion. PLEASE NOTE THIS BUNDLE DOES NOT COME WITH MOVE CONTROLLERS. YOU WILL NEED TO BUY THEM SEPARATELY. Live the game Immerse yourself in extraordinary new worlds, put yourself at the centre of an incredible gaming universe and experience a new way to play with PlayStation VR. See the future 5.7” OLED screen See hyper-real 3D environments come to life with a custom OLED screen. 360 degree vision Whichever way you turn the 360 degree immersion of PS VR makes you part of a living, breathing world with a seamless field of view. 120 frames per second Smooth visuals and super low latency combine to create an incredibly immersive gaming world. Audio immersion 3D audio Discover a new dimension in sound with cutting-edge 3D audio that lets you accurately perceive the direction and distance of sounds that are coming from above, below and all around you. Built in mic Chat to your online friends, discuss in-game tactics and strengthen your immersion in the virtual world with the headset’s integrated microphone. Play in new worlds From high-octane future sports of RIGS: Mechanized Combat League to diving in shark-infested seas with PlayStation VR Worlds, driving incredible supercars in Driveclub VR or the white-knuckle terror of Until Dawn: Rush of Blood and many more, new realities are waiting for everyone. 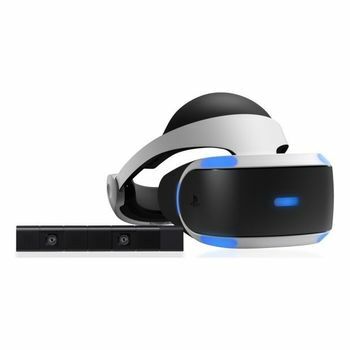 Get inside the game PlayStation Camera With dual lenses and 3D depth sensors, the PlayStation Camera tracks the position of the headset, PlayStation Move controller and DUALSHOCK 4 light bar wherever you are, ensuring you’re always at the centre of your VR gaming universe. Precision tracking Nine LEDs positioned on the front, back and sides of the PS VR headset are tracked by the PlayStation Camera – ensuring pinpoint accuracy within the game world, wherever you are in the room. Complete control DUALSHOCK 4 The PS4 precision control you love takes on a new dimension with PS VR; every game is compatible with the DUALSHOCK 4 wireless controller, while the light bar is constantly tracked to further enhance in-game movement. PlayStation Move motion controller Bring your hands into the game world and take full control of your VR experiences, giving an even deeper sense of presence and further enhancing your immersion. PLEASE NOTE THIS BUNDLE DOES NOT COME WITH MOVE CONTROLLERS. YOU WILL NEED TO BUY THEM SEPARATELY.